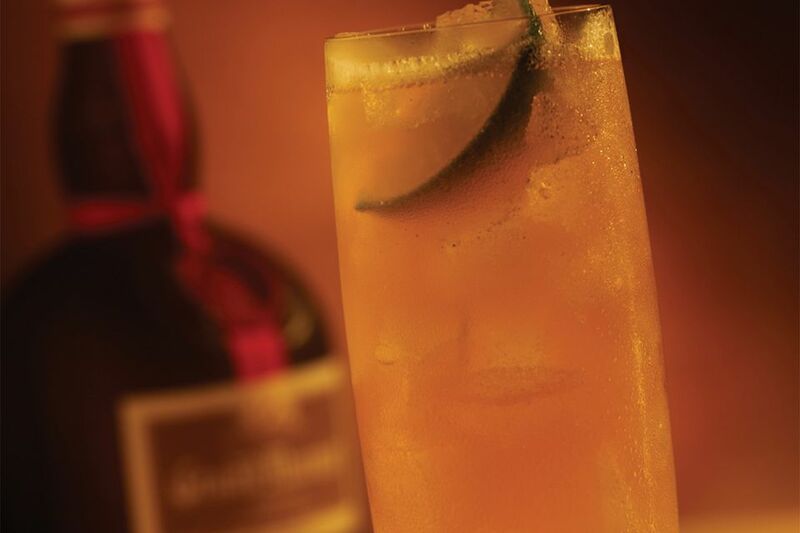 The perfect storm is Grand Marnier's answer to the dark and stormy. It's an incredibly simple mixed drink and perfect for anyone who loves the ginger beer and rum drink or the famous Moscow mule. To add to the fun, the way you'll mix this drink creates a temporary "storm" in the glass, so take a minute to enjoy the effect! This recipe is not much different than the more famous ginger beer cocktails. The main difference is that the base spirit switches from rum or vodka to the popular orange liqueur. It adds a sweet touch, which is astounding against a spicy ginger beer. The lime and bitters accents finish off the drink perfectly, leaving you with a tasty sipper that's guaranteed to rejuvenate your taste buds. Combine Grand Marnier, lime juice, and bitters in a mixing glass. Add ice and shake vigorously. Strain over fresh ice into a highball glass. Top with ginger beer and swirl it quickly to stir. Garnish with a lime wedge. If you prefer to make this drink without a shaker, build the ingredients directly in the serving glass. The shaking is nice but not necessary. To get the best tasting perfect storm, be sure to choose a great ginger beer. There are many options, including favorites like Barritt's and Bundaberg as well as those made specifically for mixed drinks such as Fever-Tree and Q Ginger Beer. For the spiciest ginger, look for a bottle of Brooklyn Crafted. With all the other ingredients carefully chosen, be sure to use fresh lime juice. You should be able to get almost 1 ounce of juice out of the average lime, which is perfect for a couple of drinks. The perfect storm is a fabulous drink to mix up by the pitcher and it would be a great addition to a backyard barbecue. Simply increase each of the ingredients in proportion for the number of drinks you need (or to fill the pitcher), stir, and serve over ice. You can even make a base mix of Grand Marnier and lime juice, then add the ginger beer in the serving glasses, letting each guest add as much they like to suit their taste. How Strong Is a Perfect Storm? Grand Marnier may be a sweet liqueur, but it's bottled at 80 proof, so it's just as strong as the average rum and vodka. That means the perfect storm may be a little stronger than you think, but it's still not bad. Though it will vary depending on how much ginger beer you pour, the drink mixes up to a pleasant 10 percent ABV (20 proof). It's like drinking a glass of wine, just far more flavorful! Seriously... A Cocktail with Beer and Campari!